This gem of a painting tells the entire Easter story as a literal procession of events through Jerusalem. Beginning with the triumphal entry in the top left-hand corner, the story unfolds down the left-hand side, as Jesus drives the money-changers from the Temple, Judas conspires with the Jewish leaders in a dark alley, Jesus celebrates the Last Supper in the upper room and then goes out to the Garden of Gethsemane where he is arrested. In the central section we re-enter Jerusalem, where Jesus is tried before Pilate in the left-hand of the five scenes at the back of the courtyard. We get a sense of the shuttling between trials that Jesus endured, as he appears on the right-hand side in front of Herod, before being brought back to the centre where he is mocked and then scourged. Finally, he is led out by Pilate in the ‘Ecce homo’ scene. To the right of the procession that left the city we see three scenes following the crucifixion: at the top Jesus is laid in the tomb by Joseph and Nicodemus. 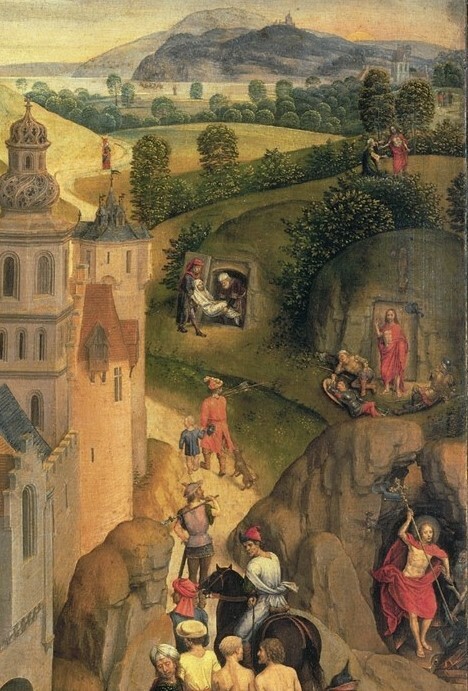 At the bottom, set against the mouth of a cave is the ‘harrowing of hell’, and in between is the resurrection, as Jesus stands at the mouth of the tomb. Finally, in the top right-hand corner are three scenes in which Jesus demonstrates the reality of his resurrection: the meeting with Mary Magdalene, the journey to Emmaus and the miraculous catch of fish (we can just make out a boat on the lake, and a single figure standing on the shoreline). Perhaps, by implication, the story then moves on to Samaria and the ends of the earth. The image is bustling with energy, with a wealth of figures, activity and detail. The painting is unified by the fall of light from the right. So the story starts in the dark on the left, and then moves in the direction of the light, pointing us to the rising of the sun on Easter Sunday, and the dawning of not just a new day but a new era, as the good news of new life goes out into all the world. 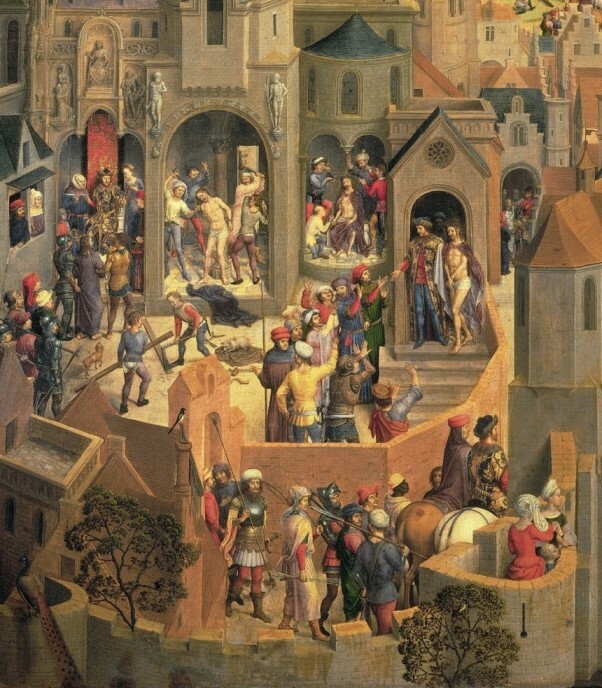 The work is also unified by the beautiful city of Jerusalem, shown here as a typically medieval Flemish walled town, albeit Romanesque rather than Gothic, as a possible nod to the historical nature of the events. 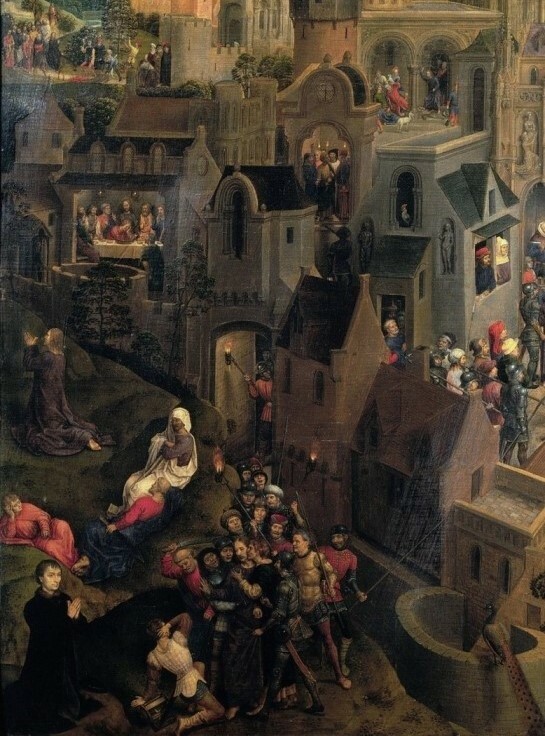 The painting was commissioned by Tommaso Portinari, an Italian banker living in Bruges, and his wife Maria Baroncelli: we see them kneeling in the bottom left and right corners. The Portinari family had their own chapel in the church of St Jacob in Bruges, and this may well have been where the painting first hung. But they presumably took it back to Italy at some point, because the first extant recording of the painting is in the collection of Cosimo I of Florence in 1550. It reminds us that the wholeness of the Easter story is vital. The crucifixion without the resurrection would be tragic. But as part of a story that begins with the King entering his capital city on a humble donkey and ends with the triumph of his resurrection, it resonates with hope. The crown of thorns on its own would be an act of cruel mockery: but in the context of the whole story it is pregnant with meaning, for Jesus really is the King and this is how he rules, and this is why they wanted to get rid of him. In isolation, Peter’s denial and the crowing of the cockerel (seen high up in a niche just as the arresting party re-enters the city) would be a permanent shame on him. But in the context of the whole story it is a beacon of hope that all of us can be forgiven and restored through what Jesus achieved on the cross. For there Peter is again – at least in our imagination – in the boat at the top right, leaping into the water to come to Jesus, who reinstates him. 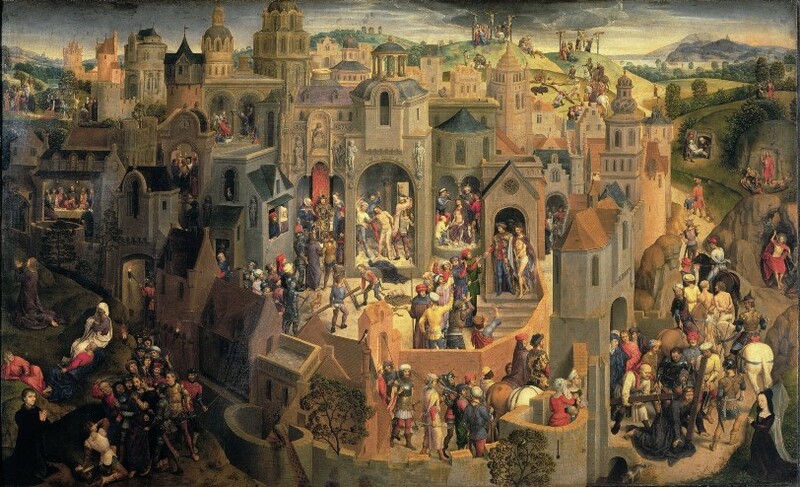 Hans Memling: Scenes from the Passion of Christ, 1470-71, oil on wood panel, 56.7 x 92.2 cm. Galleria Sabauda, Turin, Italy. Hans Memling was born c. 1440 in Seligenstadt, near Frankfurt-am-Main in Germany. He studied in Cologne and then in the Southern Netherlands under Rogier van der Weyden (1399 – 1464). He continued to live in the Southern Netherlands, where he enjoyed great success as a painter, with commissions to paint around thirty altarpieces, many religious works and over thirty portraits. In c. 1480 he painted a second ‘narrative’ painting, The Advent and Triumph of Christ, now in the Alte Pinakotek, Munich. He died in Bruges in 1494.